As1 sat. image at 10.30 pm ,Friday. The next official up gradation, by international models, on AS1, will be 6 hrs after the last, i.e. at 12.30 am IST (Saturday). But, seeing the latest sat. image, as on 10.30 pm IST, Friday, we can make a personal assessment of the movement. I think, seeing the sat. image, the centre would be at 19.8N and 71E. This is purely a calculation and observation study on sat. image. 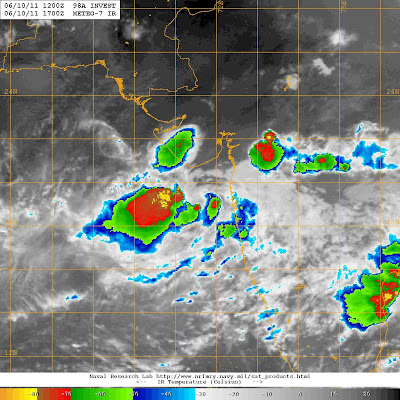 The clouding has moved northwards into Saurashtra, and the overall NW movement seem imminent.Clouding along Mah. coast has reduced, especially in the last 2 hrs. Next update Saturday morning 9.0 am. As on Friday morning, Gaganbavda in Mah. received 15 cms of heavy rain, and Ratnagiri measured 14 cms (144 mms). Generally ghat stations in Mah.receive rain from systems form Arabian Sea nad the Bay. But, Bay systems and UAC are generally more effective in pouring very heavy rains in the ghats. Mumbai lakes, are , I beleive, are having 1.92 lmls of storage water as on 5th June 2011. Last year on date was 0.56 lmls and full capacity is 13.0 lmls. At 4 am : its pouring with gusty winds. Hearing thunder & heavy rains for quiet a while now. Has UKMET & CNN once again got it right. Could be very heavy rains till morning. Thanks Rajesh - keep it going!! !